This will be the final month of RAF Coningsby movements, I would like to thank all the people that have sent me logs over the years. I have busy work commitments and am finding it hard to get regular reports of daily movements. I will still post logs sent to me and updates of changes in the Typhoon fleet. The base will finish normal flying for the Christmas break at 16:30 on the 19th December. 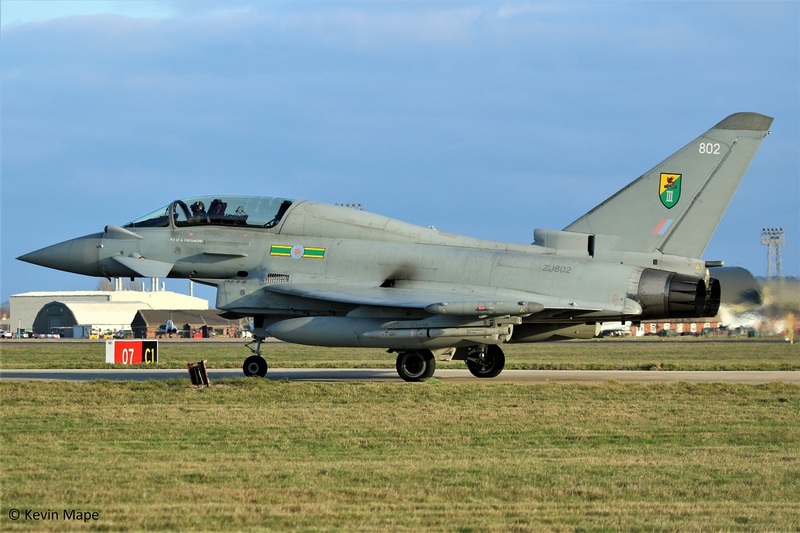 RAF Coningsby movements December 2018. 3rd Mon Log thanks to Susie. ZJ931/931 code only c/s “Triplex 32” performance. 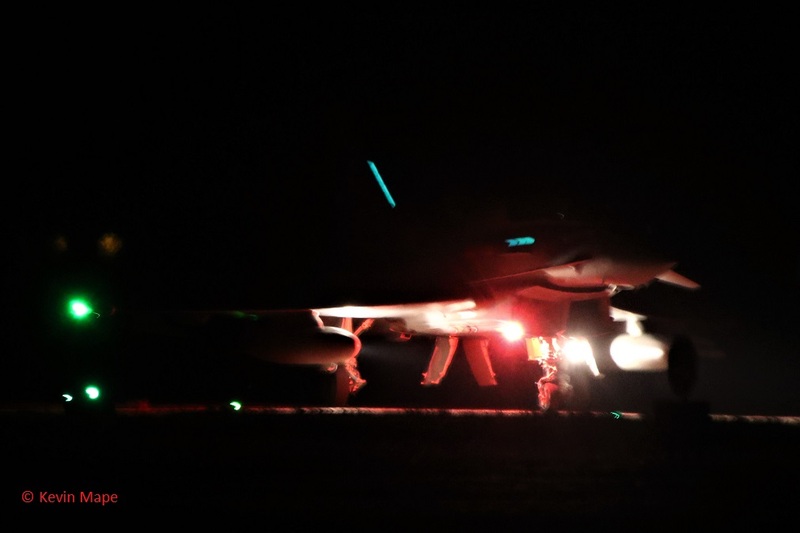 17: 50 – Night flying. G-MAJB/JB/eastern/Jetstream 41 c/s “East Flight 102” in “103” out. PM631/BBMF/Spitfire PR XIXe – first engine run for 4 years. ZM418/418/Airbus A400M Atlas c/s “Ascot 477” – Overshoot. XX278/RAFAT/Hawk T1A c/s “Red 3” – low pass. G-MAJB/JB/Eastern/Jetstream 41 c/s “East Flight 105” in “106” out. G-MAJB/JB/Eastern/Jetstream 41 c/s “East Flight 104” in “105” out. G-MAJB/JB/Eastern/Jetstream 41 c/s “East Flight 10H” in “102” out. 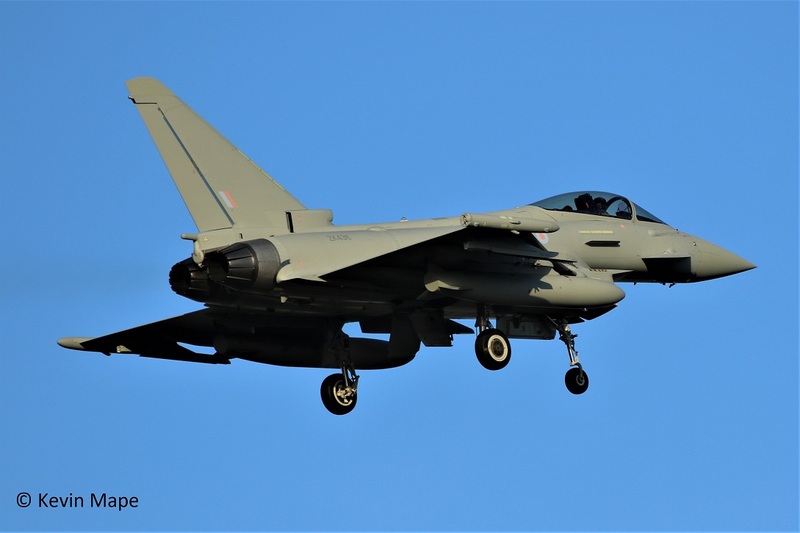 ZK331/331 code only c/s “Ascot 9693” – Typhoon FGR4 – returning from Cyprus. 11th Tue Log thanks to Steve & Val & Garf. ZJ928/928 code only – Noted on the Wash pan. ZK307/307 code only – Towed from Foxtrot to TMF. 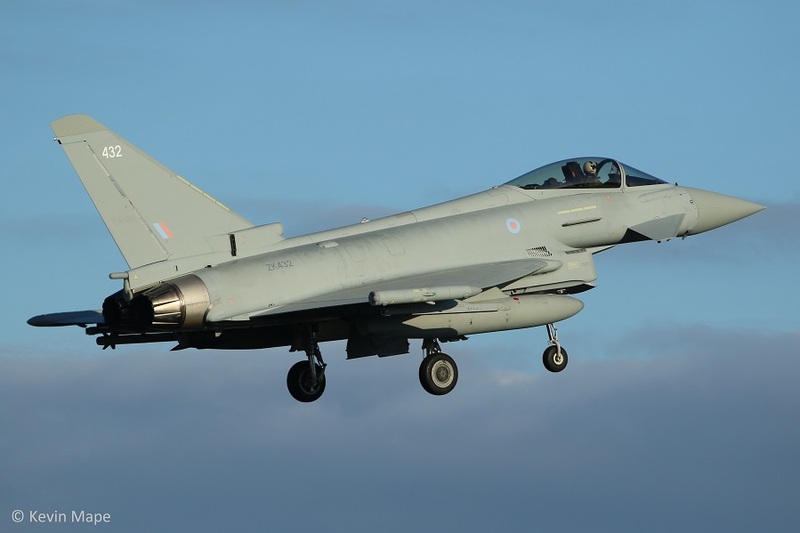 ZK345/345 code only c/s “Typhoon 12” – Delivery from TMF to RAF Lossiemouth. “Warlord 11” – Ground abort due to Fog. “Warlord 12”- Ground abort due to Fog. ZK375/375/41 TES c/s “Apollo 11”- Ground abort due to Fog. ZK379/379/41 TES c/s “Apollo 12”- Ground abort due to Fog. ZK376/376/41 TES c/s “Apollo 13”- Ground abort due to Fog. “Rampage 11”- Ground abort due to Fog. “Rampage 12”- Ground abort due to Fog. “Rampage 13”- Ground abort due to Fog. ZK327/327 – QRA radio check – 11-51 am. G-MAJB/JB/Eastern/Jetstream 41 c/s “East flt 102 ” in “103” out. ZK339/339 code only c/s “Rebel 87” – Meteor missile trails. ZZ418/14Sqn/Beech Shadow R1 c/s “Widget 48” – Weather diversion. 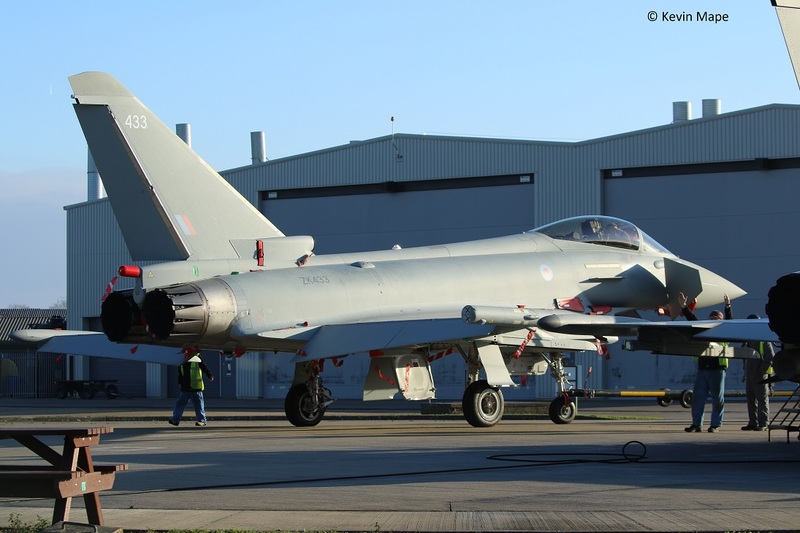 ZK358/Unmarked – Towed from HAS 3 to HAS 1 – off QRA duty. 12th Wed Log thanks to Garf. G-MAJB/JB/Eastern/Jetstream 41 c/s “East flt 10H ” in “102” out. ZK342/342 code only – Towed from the Wash pan to TMF. ZZ418/14Sqn/Beech Shadow R1 c/s “Widget 48” – Departed after night stop. – Weather diversion. TE311/SZ-G/BBMF/Spitfire LF XVIe – Noted outside BBMF. ZK339/339 code only c/s “Apollo 23” – Operated from Foxtrot. N242CV/Da-42 Twin Star c/s “November 242 Charlie Victor. Crew ferry from BAe Warton. ZK436/Unmarked c/s “Tarnish 10” – Delivery from BAe Warton. N242CV/Da-42 Twin Star c/s “November 242 Charlie Victor ” – To BAe Warton. TMF – ZK342/342 – Noted on the Wash pan. ZK308/308 code only – Noted on the Wash pan. ZK433 code only – Towed onto the Wash pan. G-BYWB/WB/East Midlands UAS /Tutor T1 c/s “UAH 80” – Overshoot. ZJ363/363 code only c/s “Typhoon 36” – PD Leeds Bradford. G-MAJB/JB/Eastern/Jetstream 41 c/s East Flt 104″ in “105” – out. Foxtrot – ZK317/317 , ZK307/307 . G-MAJB/Eastern/Jetstream 41 c/s “East Flt 10H” – Parked on Sierra. ZK327/327 – QRA radio check. G-MAJB/Eastern/Jetstream 41 c/s “East Flt 103” – To Marham. Spitfire LF XVIe : TE311/SZ-G.
Spitfire PR XIXe : PM631. 17th Mon Log thanks to Garf. Echo – ZK331/331 code only. Wash Pan – ZK318/RAF 100 tail. G-MAJB/JB/Eastern/Jetstream 41 c/s “East flt 10H” – Parked on Sierra. ZJ916/916 code only – Noted outside Hangar 1. ZJ920/920 code only – Noted outside Hangar 1. ZF205/205/1FTS/Tucano T1 c/s “Lima 51” – Overshoot. ZK433/433 code only – Engine runs on the ASP. G-MAJB/JB/Eastern/Jetstream 41 c/s “East flt 106” – Departed. 41 TES – ZK376/376/41TES , ZK339/339 code only. 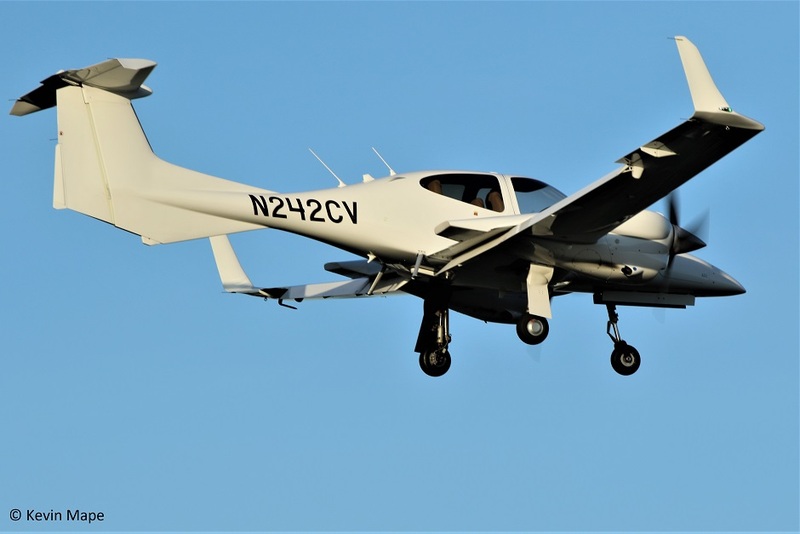 19th Wed Last day of flying for 2018 – 16 : 30pm closed to normal flying. AM Log thanks to Garf. ZK347/347 code only c/s “2 Golf Zulu 47” – QRA. 41 TES – ZK379/379/41 TES. Merry Christmas to you all , Lets hope RAF Coningsby has a good safe 2019. 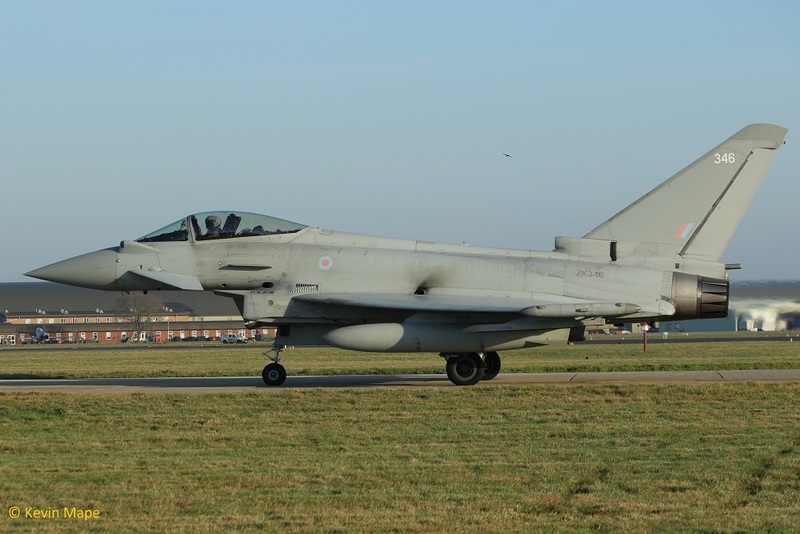 29 Sqn – c/s Typhoon 29-55,100 series,300 series. Cobra, Gunfighter, Triplex, Warlord. ZK342 : 342 : code only : Noted on the ASP 12/12 & 13/12. ZK343 : 343 : 29 Sqn : Back flying with 29 Sqn by 3/12. ZJ812 : 812 : 29 Sqn : on RTP. ZK326 : FB : 1(F)Sqn : * Stored. ZK433 : 433 : Noted on the Wash pan 13/12 .